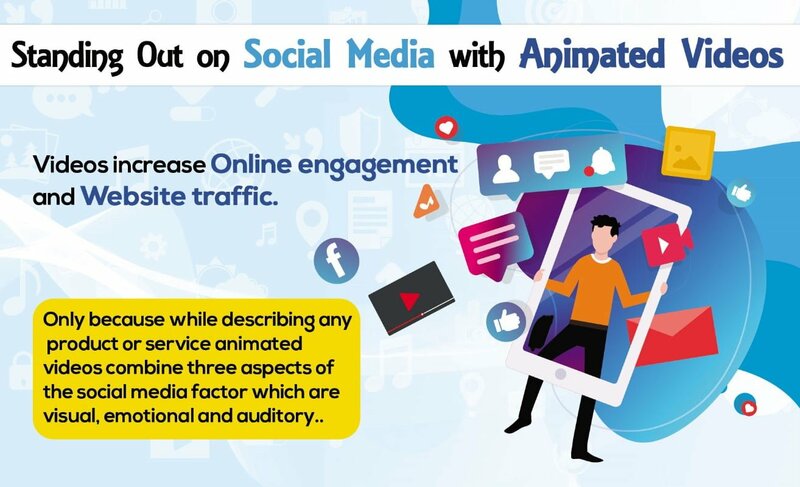 The blog entitled ‘Standing Out on Social Media with Animated Videos’ discusses how an animated video can prove to be an effective medium for the promotion and advertisement of business. It is seen that a human brain retains visual imagery more than a readable text. Animated videos in beautiful audio-visuals attract the viewers’ attention faster on the social media. These videos are short and can be customized as per your needs. Such videos are less time consuming and involve lesser production costs. Animated videos give you wider audience and can be shared by millions on other social media platforms. These are entertaining and informative at the same time. With a plethora of benefits of animated videos, it is highly recommended that one should invest in it. Retains Attention: Animated Videos are considered to be the most effective and cheaper way to reach out to the masses. In a survey conducted, it was noted that a human has a power of visualizing 60000 times faster than reading from a text. Ninety percent information received in brain is imagery. People spend almost 2.6 times more on average if there is a video on any webpage. So, People Love videos, but why go with animated Video? Only because while describing any product or service animated videos combine three aspects of the social media factor which are visual, emotional and auditory. Videos and animation can help the sales in future stages. Animations can present introductions, bridge points and actions inside videos in a short period of time that builds a strong resonance inside the viewers for a long time. It has the ability to create conversations which will eventually make someone follow the complete story. Simplification: Animation can make the characters do different actions like talking or walking which texts cannot. Videos find a better reception as 59% of the marketers believe that people tend to prefer watching videos over a monotonous reading of the text. It can process different kinds of work and can define any mechanism. Make complex points fun: With liveliness, there is an awesome delicacy that enables you to improve and clarify complex topics without getting exhausted or sounding critical. You can make any topic fun with the help of a few affected animations.Quick: Animated videos have a tendency to go viral with the blink of an eye and with a tap of our finger. It fetches us quick acknowledgement. It is a medium through which you could directly be in link with the targeted audience and earns you quick credibility. 52% of the marketers believe that animated videos are an effective way of branding . Lesser Production Cost: Creating and uploading animated explainer videos in social media is much cost effective and low-Priced than shooting a film or live video. Animated Videos can be a great strategy for business promotion or advertisement on the social media. These videos come with so many benefits listed below. Short Videos: Short videos on social media platforms go viral in less than a minute. They earn you an audience of millions even before a second passes by. Animation is the most potent tool which makes it happen. You cannot afford to lose the sight of an animated video even for a fraction of second. Autoplay of Newsfeed Video: In the Newsfeed, the videos play without any utterance. The silent flux of visuals attracts the viewers’ attention and makes them curious. Give you quality: Only the relevant and concerned lot of the viewership would come your way as such clips give a fair idea of what they are about. Different Videos on Different Media: Animation allows you to make customized videos. It is both a lively and lovely medium to reach out to the masses. They can be tailor-made for all sorts of social media such as Twitter, Instagram, LinkedIn and even Facebook. Animation is open to modification and fetches you desired engagement. It adds on the chance of experimentation and grabs the scope of adequate marketing. Other Animated Content: A study generated that content like info-graphic posters could also be animated. They are magnetic and captivating. Quality: Quality along with a simple message and bright visuals makes the animated videos stand out on the social media. Animation becomes an important tool to create good quality videos. Value: An animated video with proper value makes a great offer to the audience. The efficiency of the appeal makes the video irrefutable. Personal Data Inclusion: Adding a personal touch to the video and incorporating stories in videos attract and at the same time bring the audience closer. It earns you a web family as a survey shows that people spend nearly 3 billion hours in watching videos every month. Possibilities with Animated Videos: Animation makes the process easier and can accompany someone to social media campaigning. It can be utilized in myriad ways. Animation can help you to explore endless possibilities with clarity and depth, which can enrich the brand and widen the horizons of your opportunities.